Sweet & Simple ceremonies are small intimate weddings that can be planned on short notice in the case of elopements or they can be planned in advance. Typically there is no wedding party, just a handful of guests and not a lot of fanfare. The ceremony is therefore scaled down and not as personalized as the Bells & Whistles ceremonies but customized to fit you. Your beautiful ceremony can be religious, spiritual or secular. To the simple ceremony we can add recognition of parents and children of the couple (if any) and a unity ceremony. You can choose from a selection of vows or write your own. Either way, you will know in advance what Kayelily will be saying on your wedding day. Bride stepping up onto stool for the kiss! Congratulations to Phyllis and George and their sweet pup, Romey! Kelly and David built a gazebo for their backyard just for the wedding surrounded by their families and friends. Ceremony included the family unity sand ceremony in which the children of the groom participated and they became a family officially! 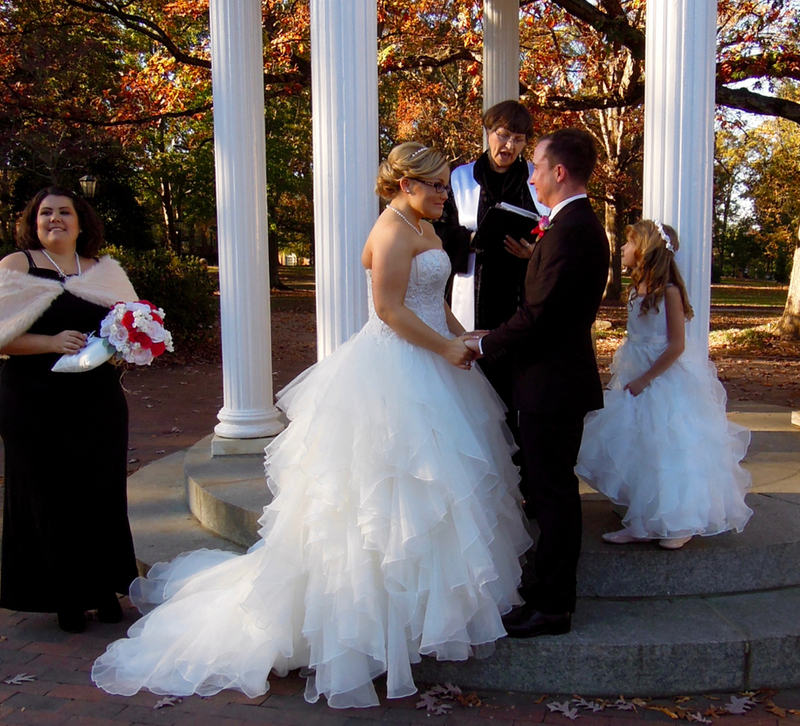 Sweet wedding at the UNC Bell Tower--a sentimental part of their relationship. What a fun backyard wedding! A family wedding in Kayelily's wedding garden. The groom surprised us all by bursting into song as he made his unforgettable vows to the bride! So romantic! A wonderful family wedding for Stephanie and Josh with a sand ceremony blending their families together. Kayelily's wedding garden. Many military weddings are "hurry-up" affairs and Kayelily is happy to accommodate these sweet couples. These simple yet very meaningful ceremonies are often in Kayelily's Wedding Garden, or in the couple's backyard, public parks, college campuses, or in restaurants. One of the most popular places in Raleigh for these small weddings is the historic Second Empire on Hillsborough Street. Contact Kayelily now with your date/time/venue! If you know your date/time/venue, it is time to book your officiant, the only vendor legally required at your wedding. Don't wait, the best wedding ministers book up fast!